Heie, O. 1980. The Aphidoidea (Hemiptera) of Fennoscandia and Denmark. I. General part. The families Mindaridae, Hormaphididae, Thelaxidae, Anoeciidae, and Pemphigidae. Fauna Entomologica Scandinavica. Vol. 9. Heie, O. 1994. Aphid ecology in the past and a new view on the evolution of Macrosiphini. in Individuals, Populations and Patterns in Ecology. (eds. S. R. Leather et al.) Intercept, Andover. Page: Tree of Life Aphididae. 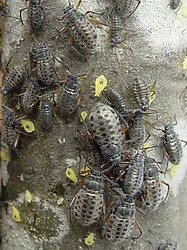 Aphids, plantlice. The TEXT of this page is licensed under the Creative Commons Attribution License - Version 3.0. Note that images and other media featured on this page are each governed by their own license, and they may or may not be available for reuse. Click on an image or a media link to access the media data window, which provides the relevant licensing information. For the general terms and conditions of ToL material reuse and redistribution, please see the Tree of Life Copyright Policies.